I’ve also been playing around with Google Maps, and have created a map showing the major Northern Ireland locations used for Game of Thrones thus far — just in case anyone’s planning to visit. You can explore the map below to find the locations (blue pins) and see what was filmed where, or you can scroll down and read the location notes on this page instead. There’s also a wonderful slideshow of location photos that I found on flickr at the end of the post. Warning: plenty of spoilers ahead if you’re not up-to-date with the show! Castle Ward is stately home set in a 820-acre estate. It has served as parts of Winterfell, the ancestral seat of House Stark. However, much of the exterior views are of an actual castle in Scotland improved with some CGI. 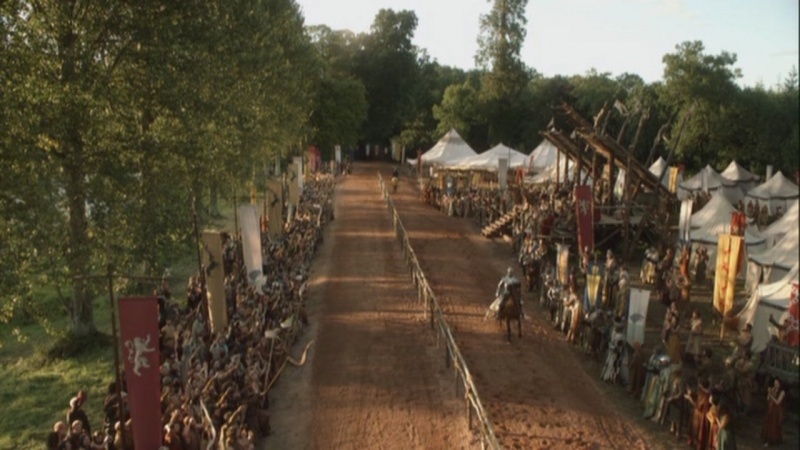 The grounds of Castle Ward Forest Park housed the Lannister encampment in the first season. The shores of the nearby lough saw Brienne of Tarth despatch a group of wildmen while escorting Jamie Lannister to King’s Landing, and a distinctive arched bridge has been seen several times. The fact that Shane’s Castle has provide locations for both the frozen northlands of Westeros, and the more-temperate south, would seem the perfect testament to Northern’s Ireland’s changeable weather. Read about the legend of the Banshee of Shane’s Castle…. Below the slopes of Slemish mountain (where St. Patrick slaved away minding sheep when first brought as a slave to Ireland), lies the Shillanavogy Valley, which provided the location of the Dothraki camp early in the series. This location is where (in season 2) the ‘Red Priestess’ Melisandre of Asshai gave birth to her ‘shadow baby’ who later kills Renly Baratheon. The caves are a short walk from the village. With views of Rathlin Island and the scottish mainland, Murlough Bay is breath-takingly beautiful, but hard to get to. Visitors have to follow a narrow road winding down a steep incline, andd some simply give up and go to one of the more-accessible strands. For Game of Thrones actress Michelle Fairley (Catelyn Stark), shooting at Murlough Bay was very special, because she used to swim there as a child. Murlough Bay provided the backdrop for Theon Greyjoy and Asha riding to the road to Pyke. The Dark Hedges is an avenue of 200-year-old beech trees on the Bregagh Road near Ballymoney. They were already one of Northern Ireland’s most-famous landmarks long before Ayra Stark escaped from King’s Landing disguised as a boy. The avenue is said to be haunted by the Grey Lady, a ghost who appears at dusk, but she has not made her debut in the series just yet. Around the other side of Fair Head, you’ll find the village of Ballycastle, birthplace of both Conleth Hall (Varys) and the character he plays, as some of the Free Cities’ scenes have been filmed there. The Dark Hedges as it appears in GOT and real life. Perhaps better-known as the site of the Carrick-A-Rede rope bridge (which has not yet appeared in the series), the famous peninsula accessed by the bridge has been seen in the background several times in the series, but most notably as Storm’s End, seat of House Baratheon (again, with the help of some CGI). Several key scenes were filmed there. The exterior set for Castle Black was built near Larne, in the Ballylumford area, on the northeast side of the harbor. Another may have been built on the south side, at Mahermorne. A small village north of Larne, Cairncastle has proven another versatile location. 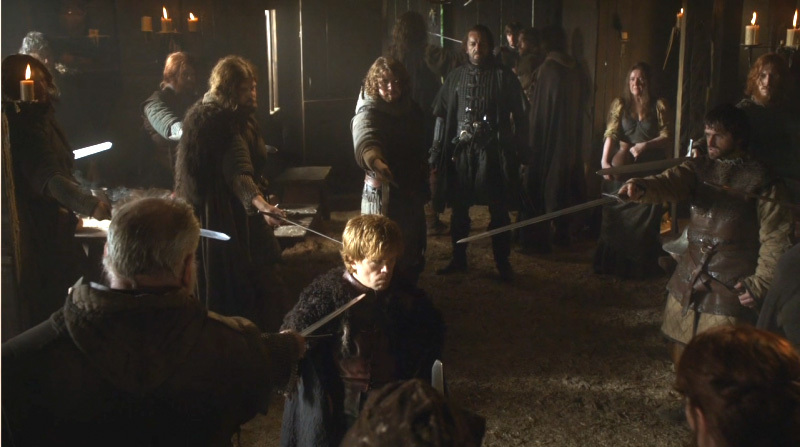 Ned Stark beheads the Nightwatch deserter here in episode one, and Catelyn captures Tyrion. Various other minor scenes have been shot around the area. No direwolves are currently thought to be roaming these hillsides, however. Viewed from the beach below (Downhill Strand) the Mussendun Temple was seen on the cliffs overlooking Dragonstone, when the seven idols of Westeros were burned. (For location shots for this scene, see the slideshow below.) The Temple was originally built as a library in imitation of an ancient Roman temple, it’s now used as picturesque setting for weddings. The temple is part of the Downhill Estate, but Downhill House itself was gutted by fire in the 1800’s, and is just a shell today. Perhaps it will be used in a future season of Game of Thrones? 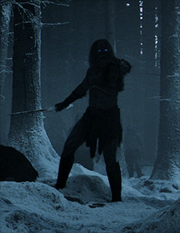 The opening scenes of the pilot episode (much of which became episode 1, season 1) where a white walker slaughters some wildlings before reanimating one of them, was filmed in Tollymore. The snow-covered woods have been the regular stand-in for the wild lands north of the wall. Tyrion being arrested by Catelyn Stark’s bondsmen. Poulnagollum Cave, Co. FermanaghNo, the filmmakers haven’t imported Gollum into GoT to try and secure a tie-in deal with Lego, Poulnagollum (which translates roughly as “hole of the doves”) is a cave in the Marble Arch Caves Geopark. It appears in the show when Beric Dondarrion hides out there in season 3. Co. Fermanagh is rich with caves, some of which are accessible through the Marble Arch Caves’ visitor’s center. The Poulnagollum cave is only accessible by trained cavers, but it can be seen by following the Poulnagollum Cave Walk route in Belmore Forest. The ruins of Inch Abbey provided the backdrop for “The Twins,” Walder Frey’s twin castles in the riverlands. 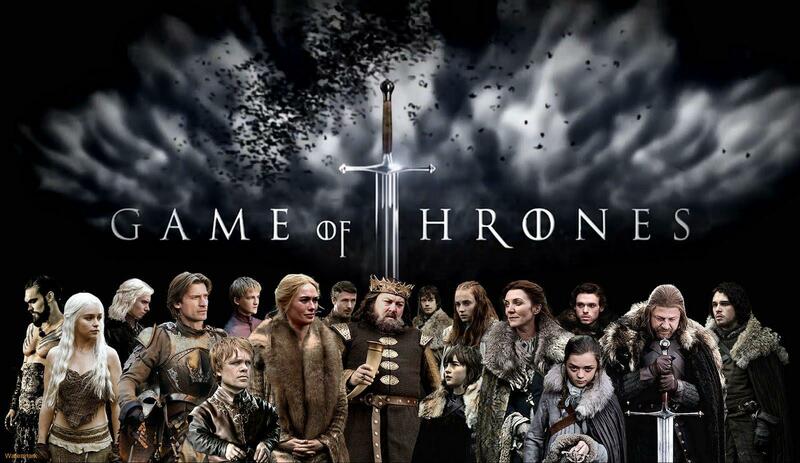 It is here that Catelyn Stark learns of her husband’s fate and vows revenge. Local photographer Amanda Killen managed to get pics at two of the Northern Ireland locations while the production was shooting: Ballintoy Harbor and Downhill Strand. Excellent! Thanks for putting that international list together Jeff. I doubt I’ll get to visit any of the others, but hoping to visit a few of the Irish locations sooner or later. I lost about 2 months to those books, and I read very fast! So, yeah. I don’t have kids either so! My brother is visiting Ireland and just left Antrim (our mother was born in village of Ligg just outside Larne/Glenarm). Relatives just informed him that Game of Thrones just filmed in Ligg. Possible to confirm that/ get details? Haven’t seen any pics or info that label Ligg as such, but there were sets built somewhere around Ballylumford and Mahermore, which I believe are just outside Larne. George, just remembered, there were some scenes filmed to the North of Glenarm, in the Cairncastle area. Some exteriors, just moody mountains and the like, and a set was built somewhere for Catelyn capturing Tyrion. Perhaps that was in or near Ligg? (I can’t find the village on my maps, so I can’t confirm exactly.) Sorry. Ligg is I believe what they call a “clachan” (collection of homes) that once existed just outside Glenarm. Only deteriorating cottages now. One was where our mother was born in 1922. She emigrated w/ her family to Chicago around 1928-29. Now 91 and still of sound mind and body. Brothers Tom and Dan just visited cousins in Larne. While there they visited Ligg and Mom’s birthplace. Tom is still visiting other parts of Ireland. Heard from family that Ligg was used in some G of T scenes. Know it will be hard to confirm, but thought I’d try. Mom is excited to near her “village” might be famous!